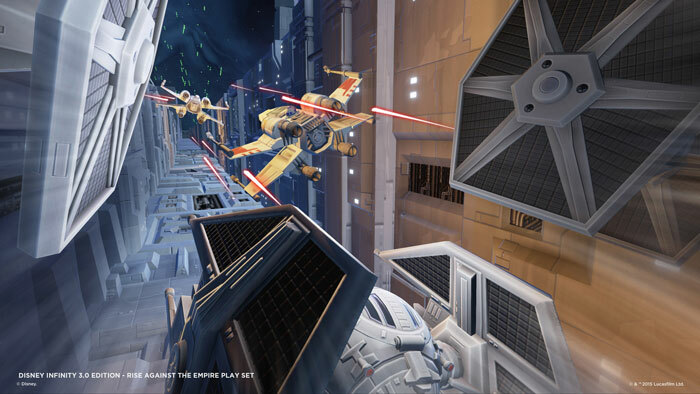 Rise Against the Empire represents the final Disney Infinity 3.0 Star Wars play set for me to review. I was originally going to review this one right after Twilight of the Republic, but Graev and I decided to share this one and he took his sweet time getting it to me. Waiting was so worth it; Rise Against the Empire (RATE) is easily my favorite play set. Rise Against the Empire is broken up into 3 main segments, conveniently comprising the three movies (4, 5, 6) and the three main planets on those movies: Tatooine, Hoth, and Endor. While RATE takes enormous liberties with the story, just like the other play sets, it actually works better than the other play sets. I want to break this up into sections on each planet where I can talk about what I really liked on each. Tatooine is the weakest of the three planets, but there are a number of fun things to do. I think they introduce the idea of credits nicely. Credits are this play set’s currency mechanic. Credits are used to buy buildings and customization info. Tatooine introduces the ability to purchase buildings and erect them in the form of a base. I’m reminded of the toy box mode with how these pop up and give you vehicles/customization. Here’s where things pick up. Hoth contains lots of missions, and some base building, but the true gem here is roping walkers. 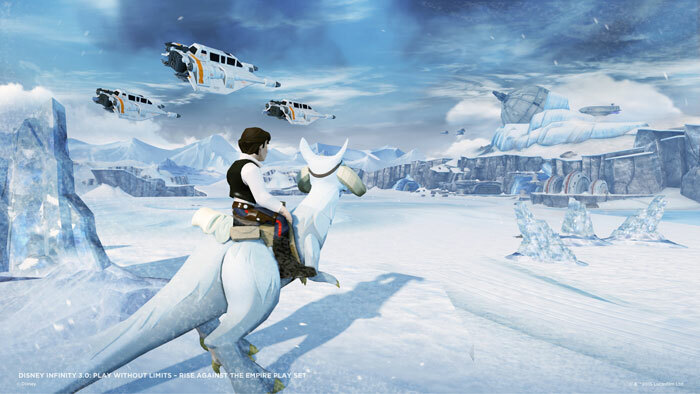 Flying a snow speeder and roping works beautifully — way better than any other vehicle use in in any Disney Infinity game. I had a blast here, especially having to rope 5 of these suckers in the mini Battle for Hoth. By far the best planet. You get to help the Ewoks do Ewoky (Ewokian?) things like take helmets from Stormtroopers, ride their elevators up and down (or in my case not realize these exist while trying to find a way to throw Ewoks…). My favorite part was wrangling AT-STs and setting traps like swinging lots, slip ropes, etc. Riding a speeder bike through the forest was also a lot of fun. The space combat and death star trench runs (plural since there New Hope and Return both had one) were executed perfectly. RATE introduced the dodge, shoot, and evade mechanics for scripted/lightly-on-rails moments which worked great. Saving Admiral Ackbar’s fleet while destroying multiple Star Destroyers was a great space moment. The controls when not on-rails are absolutely horrible, though, and a taint on an otherwise amazing experience. Once again RATE shines above the other two play sets, this time by having the best characters. Luke and Leia come with the play set, and others can be purchased individually. Luke – Standard Jedi with a blaster, but has nice saber fighting. Straight up. Leia – Great combos that stun/knock back. 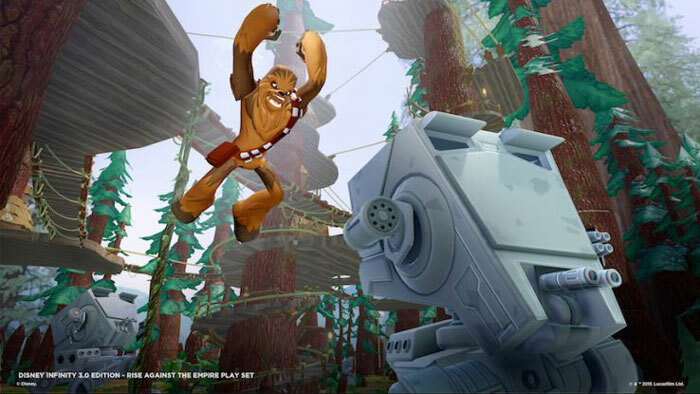 Chewbacca – Charge-up on his Bowcaster is an amazing infantry killer. Han Solo – Great combos like Leia. Boba Fett – Flying is great, and has a strong blaster, but his rocket launcher is why I use him. Darth Vader – Saber throw wins. 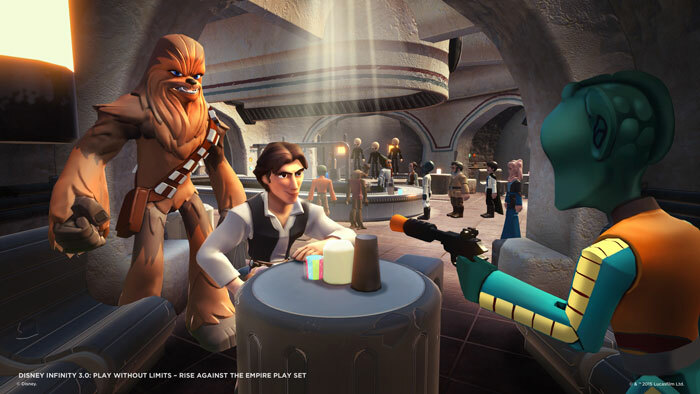 Rise Against the Empire is the best Disney Infinity 3.0 play set yet, and definitely does the best job providing a mix of vehicle gameplay and interesting/fun character use. 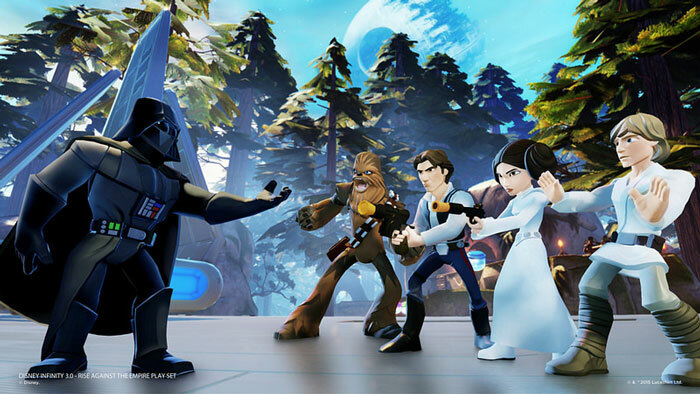 If you’re going to buy only one play set, or if you’re looking for a reason to get Disney Infinity 3.0, then I highly recommend Rise Against the Empire along with all of the characters.